Here is the picture of the 3 balls I have made so far. 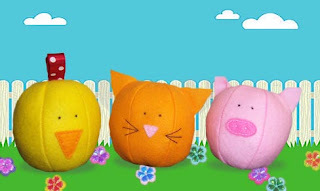 Chick, kitty and piggy!! I am trying to decide what other animals to make and also trying to get my ball making template perfect (I had to redo some seams because they were bumpy). This entry was posted in Felt on October 12, 2010 by Handmade Cuddles.